Taste test: These potato chips were thin and had a subtle but nice onion and cheese flavor. 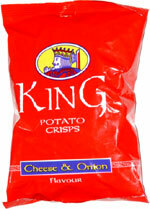 They came in a tiny bag, but King's really packed the bag full with a lot of chips, some of which got broken on the trip over from Ireland. Smell test: Not that good.